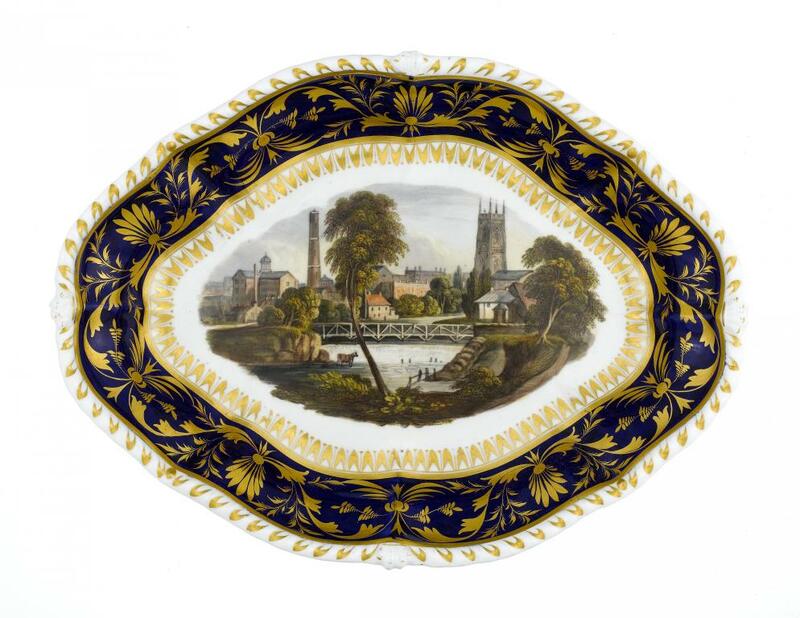 This dish has a white ground with a cobalt blue border and is gilded with eight small reserves containing a rose. The oval central reserve is bordered by a fine blue overgilded line and contains a landscape showing a river scene with a bridge, windmill, castle, house and three figures. The roses on the border were probably painted by Derby porcelain artist William Billingsley (1758–1828) and the central reserve painted by Zachariah Boreman (1736 – 1810). The dish dates from the Duesbury period, circa 1790. It is marked with the numeral 1 for the gilder Thomas Soar. 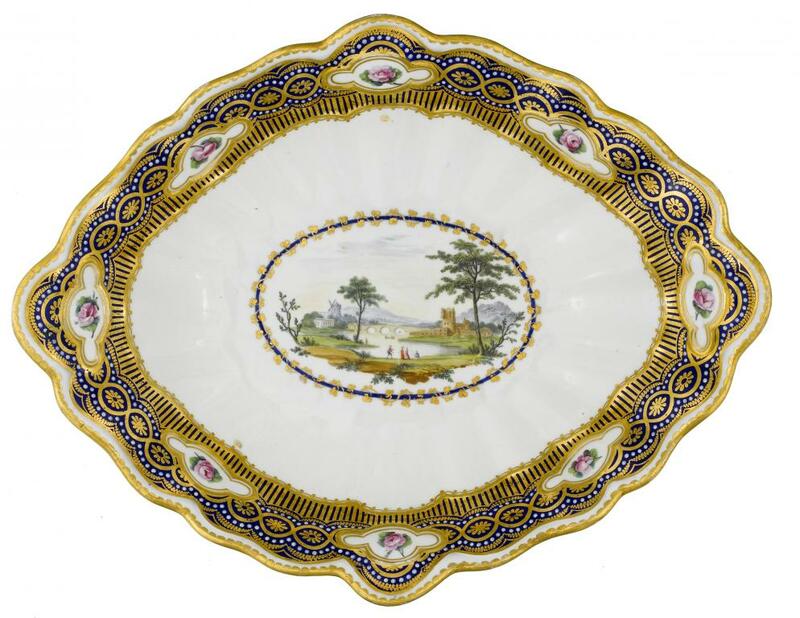 This dish has a cobalt blue ground, a gilded arrowhead border and a gadrooned rim. 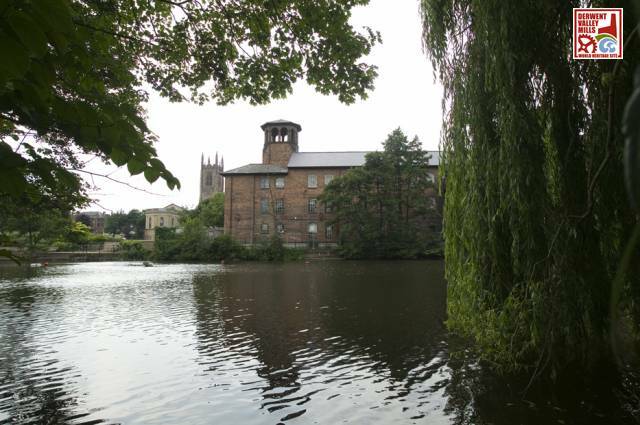 The large central reserve contains a townscape of Derby viewed from the weir on the River Derwent. It depicts St. Marys Church and the Shot Tower and was possibly painted by Daniel Lucas. It dates from the Bloor period, circa 1820 and is marked ‘Bloor Derby’ enclosing crown in red printed circular mark. 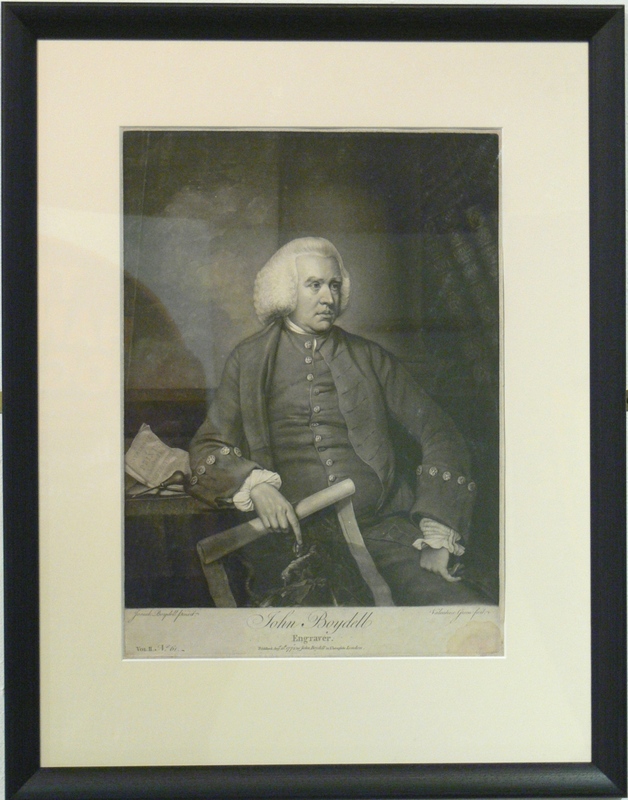 John Boydell was one of the richest and most powerful print publishers of the late 18th century. 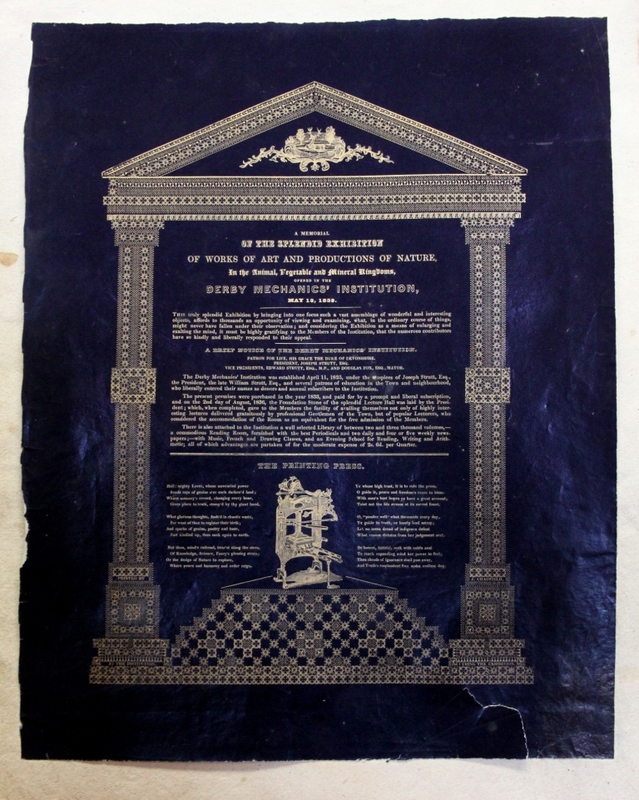 He started his career as an engraver and eventually saved enough money to establish his own print publishing business. 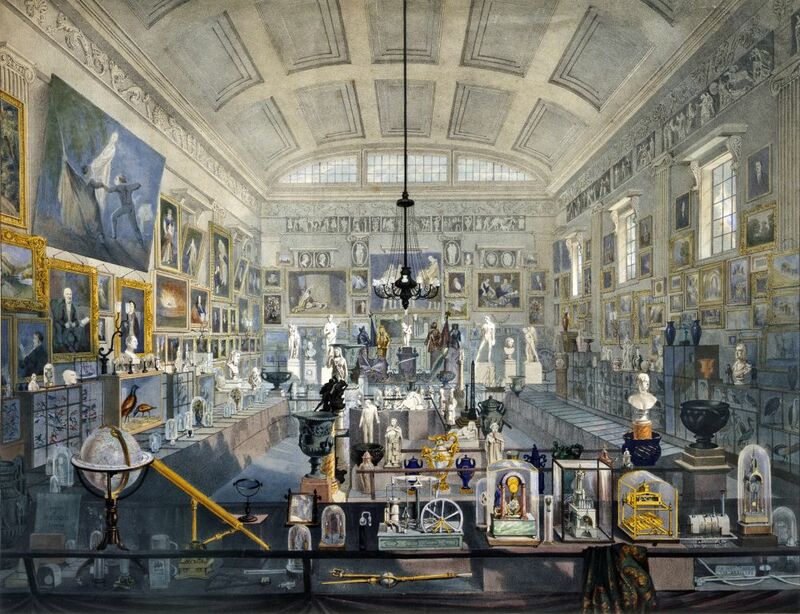 He acquired the license to reproduce paintings by Thomas Smith of Derby. His print shop in Londonwas well patronised by travellers and people wanting to look fashionable and knowledgeable. Valentine Green is considered to be one of the greatest mezzotint engravers of the 18th century. Green produced affordable mezzotints after the paintings of the most leading and contemporary artists of his day, including Joseph Wright. The mezzotint is a form of engraving, or intaglio printmaking. Unlike linear engraving methods, in which the desired image is incised and ‘scooped’ out of a metal plate creating a sharply defined line, mezzotint involves the roughening of a metal surface (the resulting texture is called the ‘burr’), which enables the achievement of smooth gradations of tone. The result is an impression that appears velvety and painterly. Due to the finely worked surface of mezzotint plates, the lines of the engraving were easily worn away by the production of repeat impressions, so the first and darkest impressions were considered the most valuable and of the highest quality. At the beginning of October Chatsworth House held a three day auction of furniture and personal artefacts belonging to the Devonshire family. 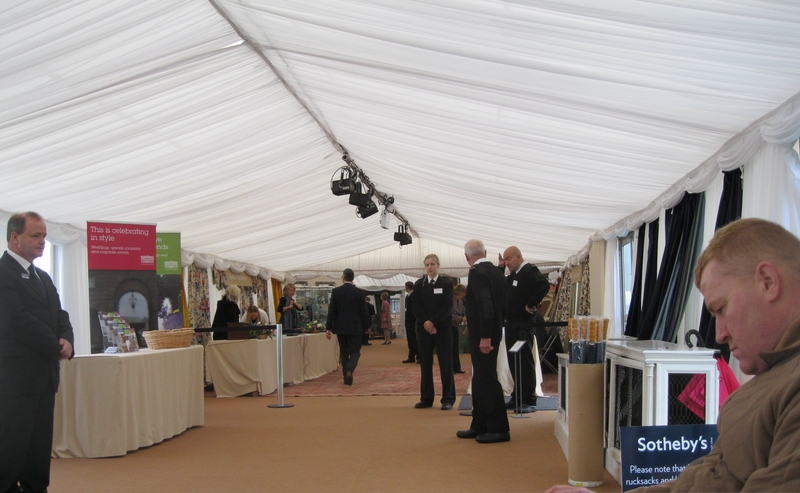 With over 20,000 objects for sale we felt sure that there would be some interesting and Enlightenment related lots. The catalogue was excitedly passed around and Ros Westwood, Derbyshire Museums Manager went to have a look at some of the objects in person. We decided to bid on lot 279, lot 423 and lot 453. Things started off well as we successfully secured lot 279 – the lot we were most interested in. 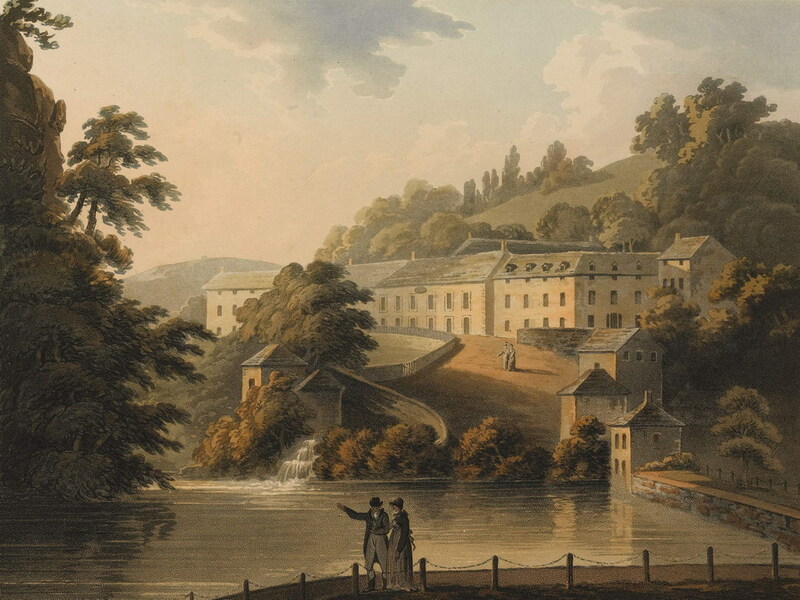 We are now the proud owners of six John Bluck early 19th century prints of Derbyshire that show scenes of popular places such as Dovedale and Matlock Bath. Things didn’t go as smoothly on the other two lots as the hammer fell way above their estimated price (and our bid!). 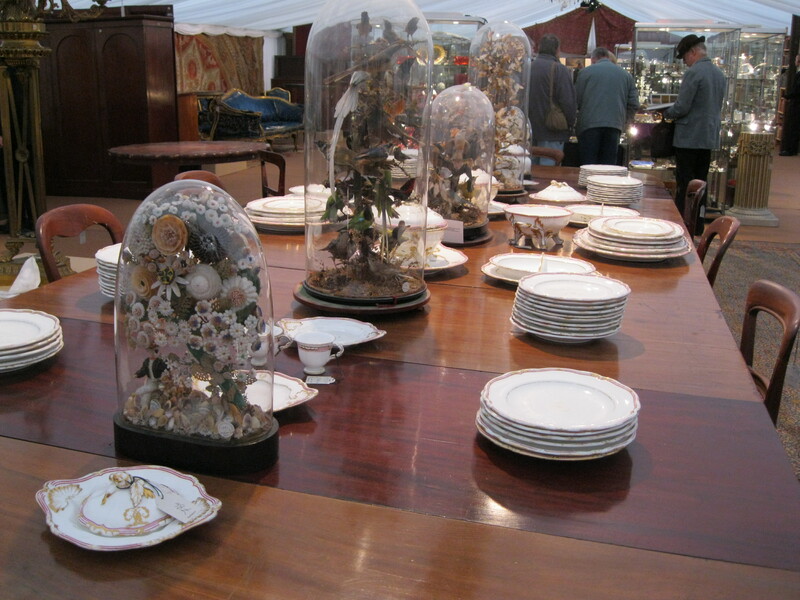 The first was an Ashford Black Marble table that went for a whopping £19,000 which was four times its estimate. 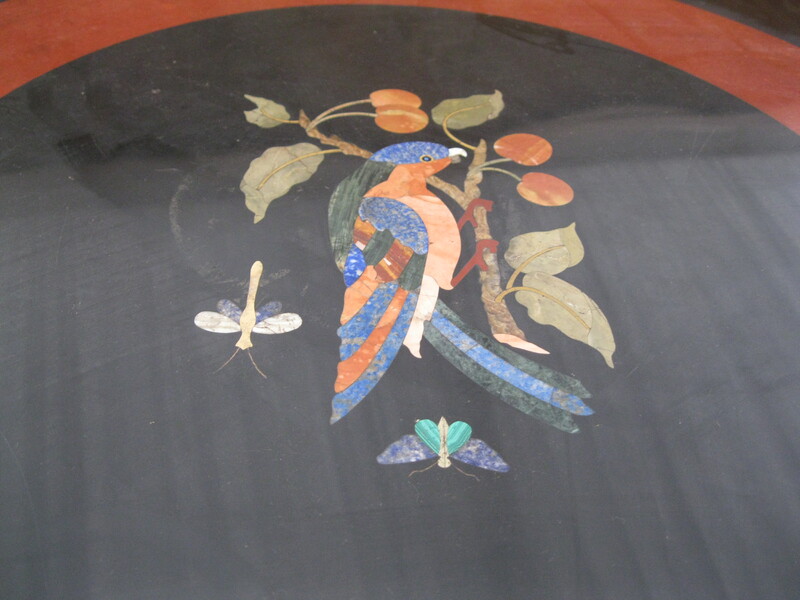 The table was unusual as it featured a dragonfly and a large band of Duke’s Red marble. 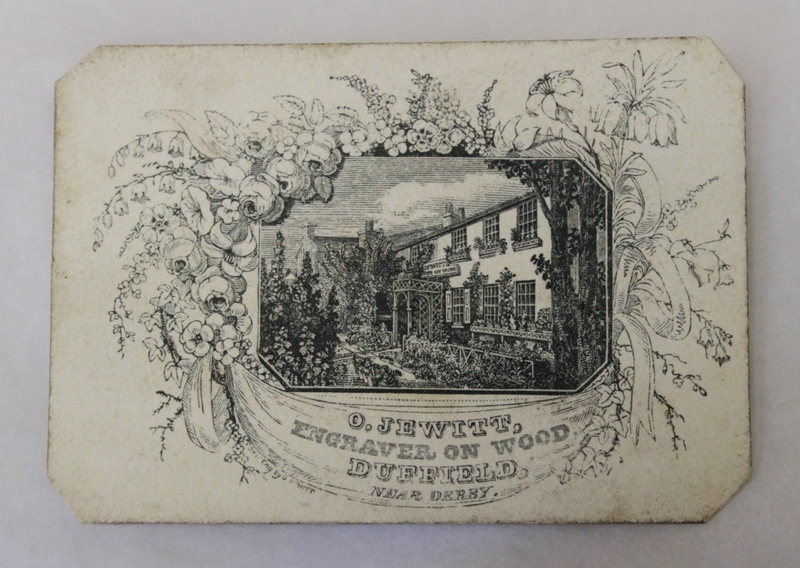 The second item was a patch box – a souvenir of Buxton – that also soared past its £150 – £200 estimate and realised £1000. 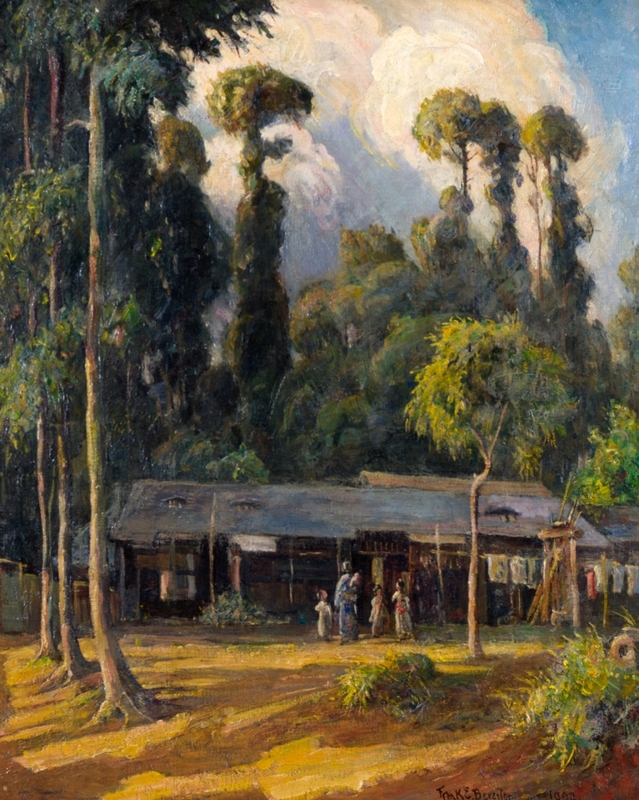 These two lots weren’t in anyway unusual in smashing their estimates; it was a general theme of the auction. It seemed that the allure of owning something linked to the great house and the Devonshire family put an understandable premium on everything. Perhaps the most extreme example is of a brooch that went for 106 times its estimate. The brooch belonged to the Dowager Duchess of Devonshire and was estimated at £80 – £100, the hammer fell at £8,500. The total auction raised nearly £6.5 million, which was £4 million more than expected. The six prints that Enlightenment! bought will be undergoing some conservation work and should hopefully go on display at Buxton Museum and Art Gallery next year. 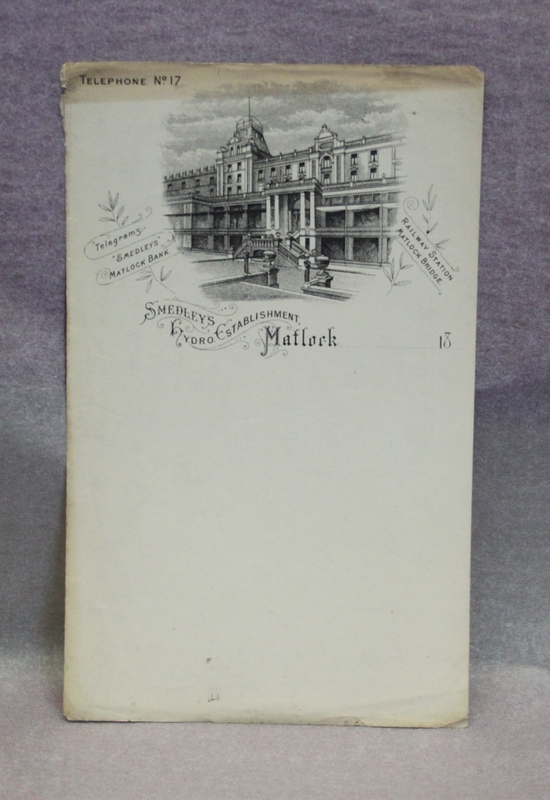 These These engravings are from The illustrated London News and show scenes of the newly completed railway line from Buxton to Matlock in 1863. They were purchased from an antiques fair in Buxton in May 2009.